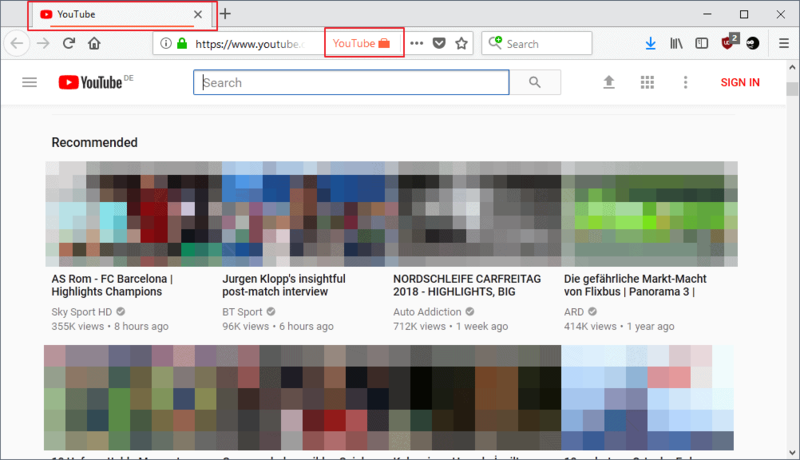 YouTube Container is a free extension for the Firefox web browser that isolates YouTube domains that you open in the web browser from the rest to improve privacy. The extension is a fork of Facebook Containers, an official extension for Firefox by Mozilla that isolates Facebook from the rest of the browsing activity to improve user privacy and limit tracking. Note: Just like Facebook Containers, YouTube Containers requests access to data for all websites even though it appears to be active only on select YouTube domains. Firefox's container functionality is a relatively new feature of the browser. Containers isolate sites loaded in the container from the rest of the browser. Isolate means that Firefox separates storage for cookies, temporary Internet files and other data; this improves privacy as it limits tracking capabilities. Another benefit is that you can open a site multiple times in the browser and sign in using different accounts. YouTube Container loads youtube.com domains in a separate container. The container is started when you load YouTube for the first time or click on a link that leads to YouTube. Firefox highlights the use of a container in the address bar and by underlining the tab. The container isolates YouTube cookies and other data from the rest of the browser to limit tracking. Note that the container is used only when YouTube is opened directly in the web browser but not if YouTube content is embedded on third-party sites. In other words, any YouTube video that is embedded on a third-party site is not loaded in the container. I predict that we will see more specialized container extensions that keep a specific site isolated from the rest of the browser. This could get out of hand quickly considering that you'd like to isolate other sites, e.g. Google, Microsoft, Twitter, as well. The Temporary Containers extension for Firefox may be an option for some as it can be used to assign URLs to the same or different containers. It is not an install and forget about it type of extension though as it requires manual configuration. If you are particularly worried about YouTube (Google) tracking you, YouTube Containers may be an extension that you could use to limit that tracking. Now You: How do you deal with tracking on the Internet? Or you just use Temporary Containers what does this for ALL websites. and of course that it deletes every data after closing the last tab. Facebook containers, now YouTube Container not to mention other domain-specific containers, some of which already available if I’m not mistaking. The trend is a container for each and every domain known to privacy invasive : the game has started and as it goes is not over. Why not forget containers and simply apply Firefox’s First Party Isolation? Even safer and far less cumbersome. @Tom – you’re very right that the game has only just started. What is great – is that even if FB continues to swell in numbers, and the FB storm blows over, what is really great is that at last….privacy, and the importance of it, is at last on the agenda. Those that don’t care at all, still won’t care, but those that are curious, have been hopefully helped to learn a bit more about how their information is used. What was also disappointing, having watched a lot of it, was FB’s Zuckerberg questioning session yesterday….. the disappointment was not so much him (answers=to be expected), but the very poor quality of the people scrutinizing him. And Tom………. instead of containers, how about a VM? I swear by mine, and you barely need to containerize anything, once you have a VM. Enough talk about Zuck…..now where’s that glass of lovely French wine! I need a break from all this stuff!! Time, time, time is on my side! Only time, space less! Adguard for desktop, sometimes enabling stealth mode for sites as Youtube and the like. When I mentioned the game I meant that of site-specific container extensions’ inflation, but your development on the raising awareness of privacy issues is far more interesting. I haven’t streamed Zuckerberg’s questioning sessions, only read articles and extracts of his highly formatted answers and less formatted — unless it be the result of the courses of humility he had been briefed with before — embarrassments. My belief — really: my supposition — is that the true sorrow is of having been caught rather than having caught users with illusions. What will be the impact, on Facebook’s future, on users’ awareness of privacy, social websites and FB in particular, I have no idea. Stock markets as always react hysterically and are relevant of nothing else than the subtle blend of fear and eagerness, those of wallets and nothing but wallets of course. Users? What proportion of 2 billion will have received the message 5/5 and will today, tomorrow or after-tomorrow close their FB account? Small, I’m afraid. Addiction is when thrill beats it all. Now that’s a delightful resolution! I’d love to share with you a bottle of ‘Château Lafite’ or a barrel (!) with us all here, accompanied with delicious, little “amuse-gueule” but that would be far too virtual to honor a good wine : hey! if it all works by the brains a first sensual touch is imperative! @Tom – I enjoyed to read you! I will always read at least twice, looking for subtleties of language, and to check my self that I understood the first time. Thank you! I really do believe that privacy awareness has been done a big favour by the recent FB “scandal”. And I do fear that with such a vast user-base, the best we can hope for is not the end of FB, but at last….the realisation that abuses of privacy have been carried out, even if that was ‘always part of the deal’. I read the comments section in a UK newspaper (who’s title I am rather embarrassed to admit to), and there are indeed a lot of angry people on there, angry about FB, that is. Many, many of them are saying they are going to delete their accounts, or that they have done already…..but you are right, the pervasive nature of the medium, and the ‘addictive’ part will likely have them running back soon, when their friends might reject them. So little will change, which is why privacy-awareness is the best we can hope. I’ll always remember going to the local French markets and the “cooperative”, getting wine with moules, or other lovely delicacies. Nyons has a lovely market, and the handmade soaps are heaven! But who on Ghacks wishes to read that? Apologies therefore, to all you out there!! I could elaborate, but I don’t think its fair to a technical forum! And with the VM, Oracle VirtualBox has been faultless for me….both in its’ use, and in its implementation. It makes Windows System Restore look like a very “poor” alternative to the rolling-back side of things. It’s also free, and nothing to lose but a bit of time….and hard drive space. So if time really is on your side……..give it a go! And do not worry about “concepts”, these are fabrications of the mind, that need to be broken down and re-evaluated, just in case they are found to have been false all alone. And the beat goes on? That’s a great song! Nice to read you Tom. @Sebas – thanks for that! I mean, really!!!! Zuck totally gets the question, and I cannot believe he was given such an easy ride, by the questioner immediately moving along. Let’s hope some decent people pin him down soon, very soon. They also mention other news organisations doing the same thing. We need an Amazon container as well!